The Dream Architect (機械仕掛けの夢?) is a treasure in Pikmin 2. 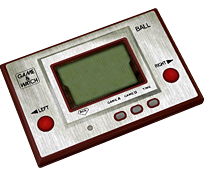 It is a handheld video game console known as the Game & Watch, a Nintendo system, the game in particular being Ball, the first one in the series. It is found on sublevel 4 in the Hole of Beasts, and is held by a Red Bulborb dwelling in the area. Many fire geysers dot this level, so remove them before collecting the treasure, or use Red Pikmin. The Dream Architect being analyzed. Texture used in the game for the text. A Game & Watch "Ball" in the real world. This page was last edited on December 12, 2018, at 10:41.